– Stonewall Jackson’s reply to Colonel B.E Bee when he reported that the enemy were beating them back. At the first battle of Bull Run, July 1861. – Stonewall Jackson, letter accompanying his requisition for 1000 pikes. I can’t guarantee that these quotations are correct or true, but I have tried to verify as many of the quotes by Thomas Stonewall Jackson as possible. 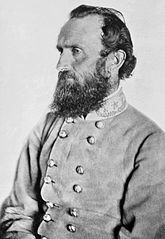 Please contact me if you find any errors in the Thomas Stonewall Jackson quotes, have some additional information about them or if you know any quotations from Thomas Stonewall Jackson that are not listed here.